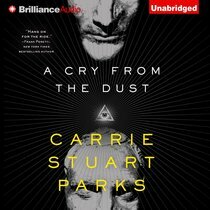 About "A Cry From the Dust (Unabridged, 9 CDS) (#01 in Gwen Marcey Novel Audio Series)"
Customer Reviews For "A Cry From the Dust (Unabridged, 9 CDS) (#01 in Gwen Marcey Novel Audio Series)"
A Cry from the Dust is a fascinating blend of fact and fiction. The Mountain Meadows Massacre is a real historical event subject to a real-life cover-up. This makes it ideal as the basis for a suspenseful contemporary crime thriller, as the secrets from the past and the events of the present begin to intertwine in a fundamentalist conspiracy that could lead to another act of domestic terrorism on the anniversary of the Massacre: 11 September. The plot is complex, with seemingly small events gradually growing in importance. Gwen is a fascinating character: a woman with an unusual and intriguing professional background combined with a difficult personal background (cancer, divorce and a rebellious teenage daughter) which means people think she's got mental health issues. She's intelligent and brave, my favourite kind of heroine. There was one thing about the writing that was slightly 'off', although I was more than half way through the novel before I worked out what it was. Most of the story is written in first person, from Gwen's viewpoint, but there are occasional short scenes in third person viewpoint, from minor characters. I'm not a fan of mixing first and third person viewpoints, and while I've seen it done better I've also seen a lot worse. This was the only glitch in an otherwise excellent novel, and I look forward to reading more from Carrie Stuart Parks.